Abstract: The planet Mars has both fascinated and tantalized humankind since the invention of the telescope and now well into the age of exploration from space. The first of three waves of space missions to Mars were flyby spacecraft that returned images of a heavily cratered planet with a thin atmosphere, suggesting Mars was more like the Moon than an older Earth. However, Mariner 9, the first spacecraft to orbit another planet, found vast channel and valley networks carved into its surface, as well as towering volcanoes, suggesting that ancient Mars was once much more Earth-like. Subsequent missions have landed on the planet and new orbiters have probed the planet at ever increasing spatial resolution and spectral coverage. As a result of the latest round of space exploration, Mars is revealed to be a complex, diverse planet— one whose climate has changed dramatically over time from an ancient atmosphere where water was active on its surface to a drier, thinner atmosphere shaped by periodic ice ages, to the present atmosphere where dynamic change continues today. 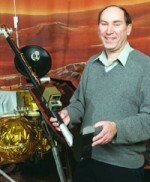 Dr. Zurek is the Chief Scientist in the Mars Program Office, Project Scientist, MRO.